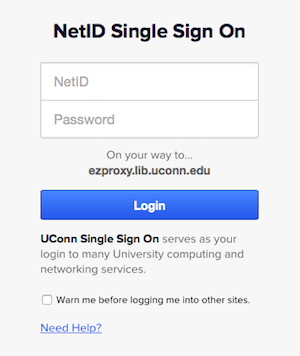 While using the wireless network on a UConn campus, you may be prompted to enter your NetID when you try to access a library research database. This is because database providers use IP ranges to verify that users are coming from UConn. If the campus IP network is overloaded, for example, then you may be asked to verify your UConn affiliation. This is normal, though generally speaking only off-campus users are required to enter their NetID. Fortunately, you only have to log in once during a browser session, so simply enter your NetID and password and continue your research. UConn’s Information Technology Services provides a handy, detailed guide on Common Video Playback Issues and Solutions. Adobe Flash and Java should be up-to-date to play streaming videos or music. Slow or spotty Internet connections may cause media to fail to load/play properly. Trouble printing a PDF? Update your PDF reader or simply download the PDF to your desktop and print from there.